The Texas Transportation Institute’s (TTI) 2010 Urban Mobility Report released Jan. 20, demonstrates that—without public transportation—U.S. travelers would have suffered an additional 785 million hours of delay and consumed 640 million more gallons of fuel during that year. The New York metropolitan region reported the longest traffic delays of the 439 urban areas surveyed, followed by Chicago, Washington, DC, Los Angeles, and Boston. "Reducing traffic congestion is one of the many reasons why the 112th Congress needs to move on passing a well-funded, multi-year surface transportation authorization bill," said APTA President William Millar in a statement. APTA also ran ads in Capitol Hill publications advocating for more investment in public transit. For more details on the TTI report, see the Jan. 31 issue of Passenger Transport. The House Republican Study Committee has called for deep cuts to public transportation programs as part of the Spending Reduction Act of 2011. The proposed cuts will affect the New Starts program, grants for Intercity and high-speed rail, and the Washington Metropolitan Area Transit Authority. In a statement released today, APTA President William Millar said the proposal is "based on the misunderstanding of the difference between investment and spending" and will put "jobs at risk, increase traffic congestion, and negatively impact the lives of millions of Americans who use public transportation." He added that the elimination of key public transportation and passenger rail programs puts more than 198,000 jobs at risk. The Federal Transit Administration announced funding for five projects through the Transportation Investment Generating Economic Recovery (TIGER) program: $63 million for a modern streetcar in Tucson, AZ; $45 million for New Orleans’ Union Passenger Terminal/Loyola Loop Streetcar; $25 million for Detroit’s Woodward Avenue Light Rail; $23.2 million for a street reconstruction in Portland, OR; and $23 million for the Downtown Dallas Streetcar. Chief executives of public transportation systems and their deputies are invited to attend the 2011 Transit CEOs Seminar, Feb. 5-8, in San Diego, CA. Attendees will participate in educational sessions on leadership styles, funding and revenue sources, investments in transit oriented development, working with a board, and labor relations. Share your insights and discuss your agency’s advances and challenges. 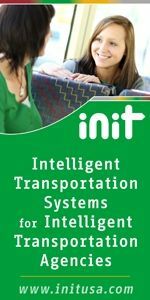 Learn more about current trends in public transportation and hear about new management practices. U.S. Secretary of Transportation Ray LaHood blogs about a television news magazine which reports on why investing in American passenger rail is good for American jobs and mobility. San Francisco MUNI is showcasing endangered species in their Bay Area habitats with four city buses wrapped with gigantic photos. A construction project to turn historic Union Depot in St. Paul, MN, into a multimodal transit hub began with ground-breaking ceremonies Jan. 18. Plans call for the revitalized station to provide connections for Metro Transit’s Central Corridor Light Rail Line, scheduled to enter service in 2014. The station appears on the National Register of Historic Places. Cincinnati <?xml:namespace prefix = o /> businesses and Metro are using Twitter as part of their daily lives. The number of Metro's Twitter followers has doubled since last year.